The Catchments Project Catalogue Essay, Artist in Residence at Creative Spaces: Carlton Connect Studio LAB14 2015.
by Emma Mayall, former curator National Gallery of Victoria. From what fount is the sea replenished by its native springs and the streams that flow into it from afar? Water is a substance that is, even now, all too often taken for granted in the developed world. Despite our increasing awareness of its preciousness and best intentions to be watchful of our consumption levels, it is still easy to convince ourselves that there is an invisible, mythical and seemingly endless ‘fount’ that supplies us with this essential element. Enough, it seems, to replenish the sea over and over, and satisfy an insatiable human thirst. In our contemporary lives we have been forced to confront the reality of environmental degradation, pollution and depleting resources. Water conservation is one such pressing environmental issue that we as a community must be held accountable for – as consumers we are complicit in the use and misuse of this vital resource. Whilst the broader scientific community have continued to debate the manifold implications of climate change and human impact on the environment over many years, it is artists who are now taking the lead in promoting awareness of climate science and engendering the cultural shift that is required to initiate positive change. In recent times there has be a strong movement towards interdisciplinary collaboration, particularly between the arts and sciences, within the context of climate and the environment. Whilst the natural world has occupied artists for millennia, from the representational to the Sublime to the abstract, this new movement focuses more specifically on a mutual exchange of ideas, data, concepts, philosophies and factual records between artists and scientists to address important contemporary issues that affect all humanity. 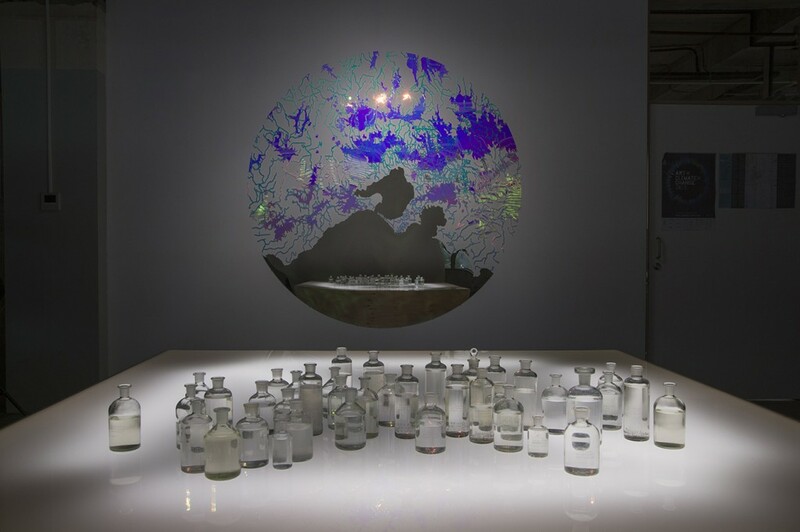 In their latest body of work The Catchments Project, artists Debbie Symons and Jasmine Targett have been positioned amongst scientists, researchers, academics and entrepreneurs who are addressing the multifarious issues surrounding environmental sustainability in the context of reduced rainfall and drought. Awarded the first Artist in Residency at Creative Spaces: Carlton Connect Studio, an initiative of the City of Melbourne, Symons and Targett have devised three research-based works Making Water Visible, The Water Harvest and Getting Busy as a way of envisioning and augmenting the significance of Melbourne’s waterways and catchments in the broader public mind. Their intention is to make water, and the engineered and natural mechanisms that supply us with water, clearly visible. The luminescent sculptural complexity of Making Water Visible maps Melbourne’s existing natural water catchments, incorporating multiple iridescent layers of Perspex to form a topographical representation of this usually unseen network or resources that supply us with water. The data for this map has been collated with contributions from the City of Melbourne, Melbourne Water and Geosciences Australia, demonstrating the benefit of mutual collaboration between the sciences, industry and the arts in calling attention to pressing global climate change issues. The Water Harvest represents Melbourne’s engineered water catchments, and each water harvester who has contributed to the installation is gifted their bottle at the conclusion of the project as a reminder that a collective approach to natural resource conservation is crucial if we are to enact, activate and adapt. They are artefacts that stand as markers for united initiative and change on a significant scale. Getting Busy ingeniously and playfully draws the public’s attention to water pollution issues in Melbourne’s waterways and asks them to be an active contributor to the solution through pledging practical everyday actions to support their local environment. As I collected a grey water sample from my own home to contribute to The Water Harvest, I reflected on the fact that despite my abiding and firm commitment to water conservation, I too often take this vital element for granted. With artists such as Symons and Targett working alongside scientists to create critical work such as The Catchments Project, we are as individuals and community members, at a local and global scale, called to task and encouraged to incorporate positive strategies that contribute to environmental sustainability within our daily lives. The Catchments Project is a part of Climarte’s Art+Climate=Change Festival, April – May 2015. Titus Lucretius Carus, On the Nature of the Universe, trans R. E. Latham, London: Penguin Books, 1994, p.15.